In 2012 dozens of major disasters occurred in the US. They are arriving more and more frequently and we need to prepare and protect our families. This handbook is your guide. User names and passwords, and much more! In a 3 ring letter size binder with pockets for a CD, flash drive and loose documents printed on easy to identify International Safety Yellow in black ink. 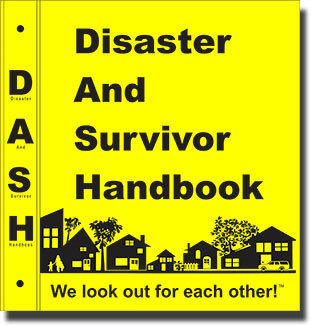 DASH is the perfect project to gather your family’s survival plans and a place to keep all your important information. Use DASH for your family’s safety. Protect your Signs from GRAFFITI! We supply 3M 1160 Anti-Graffiti coating to any medium or large reflective sign for $17.50 per sign. Add 3M 1160 Anti-Graffiti Coating at checkout. We can supply HIP signs. These maximize the reflectivity and are available in any medium or large reflective sign style and agency type for an additional $13.50 per sign. These are 3M's Series HIP signs. These special highly reflective signs require an additional 2 weeks for production and shipping; these are made to order.